Tonight, regulars NM Ian Harris, Alex Eydelman and Melvin Patrick were joined by Norwalk native Raffaello Piccoli for another exciting night of blitz chess. On paper, Harris was the favorite, however Eydelman had defeated him twice the week before so he knew he would have his work cut out for him. This much anticipated face-off came in the second round. 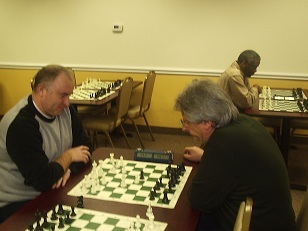 Harris won the first game but Eydelman struck back, winning the second game to level the score. This wasn’t quite the revenge that Harris had been looking for, but it was enough to give him good chances to win the tournament. Eydelman, Piccoli and Patrick all traded points. Patrick managed to score one point against both Piccoli and Eydelman. Although Piccoli out rated Eydelman by the slimmest of margins, he was unable to get the necessary point off of Harris and Eydelman won the U2100 prize. View the crosstable below for the final standings.